Her son's murder left her adrift. Victim advocacy is helping her rediscover her strength. Tabitha Dornal’s 18-year-old son, She-ar, was robbed and murdered three blocks from her West End home July 23, 2016. Seeing his killer arrested and convicted was only part of the difficult journey ahead of the mother of six — suddenly five. CINCINNATI — Tabitha Dornal’s 18-year-old son, She-ar, was robbed and murdered three blocks from her West End home July 23, 2016. Seeing his killer arrested and convicted was only part of the difficult journey ahead of the mother of six — suddenly five. “I have to deal with this situation, I have to fix the other kids that’s there, try to keep myself on guard, and there’s no help,” she said Tuesday night. No help figuring out how to plan the funeral, no help with recovery from trauma, and no help with the violent threats her family received in the aftermath. As she saved money to leave the neighborhood and hid at relatives’ homes in the meantime, Dornal learned her situation wasn’t unique. 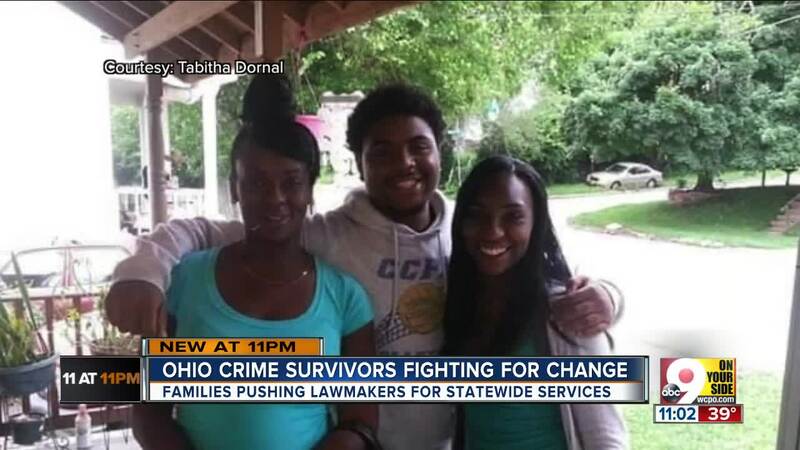 She’ll be among a crowd of violent crime survivors who take their fight to Columbus on Wednesday. They plan to petition lawmakers for statewide services, including emotional trauma centers, that can help families in the wake of life-changing tragedy. “We are there to let them know that we need funding, that we need community centers, traumatic recovery centers with professionals there ready to help people coming in the door,” she said. Hamilton County Prosecutor Joe Deters said he is proud of his office’s existing victim advocacy initiatives, which include hiring employees who walk victims of crime to court and working to make sure those victims stay informed throughout the legal process. However, he would also support changes that could expand that effort in the future. Participating in Wednesday’s rally will be another step on Tabitha Dornal’s path to regaining her voice, she said. Another was joining Crime Survivors for Safety and Justice, where she found the solidarity for which she’d longed immediately after She-ar’s death.